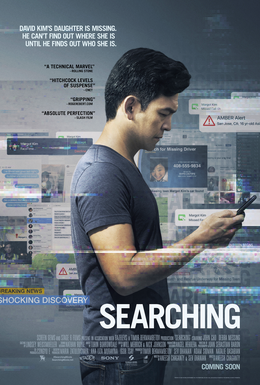 Searching is a 2018 American thriller film directed by Aneesh Chaganty in his feature debut and written by Chaganty and Sev Ohanian. Set almost entirely on smartphones and computer screens, the film follows a father (John Cho) trying to find his missing 16-year-old daughter (Michelle La) with the help of a police detective (Debra Messing). It is the first mainstream Hollywood thriller headlined by an Asian-American actor. A San Jose, California family – dad David Kim, mom Pamela & young daughter Margot – are seen in the opening credits in montages of taking photos, creating profiles on their home pc, then on Apple devices, take family photos, videos and sending mails. Pam dies of cancer leaving David to raise their teenaged daughter on his own. 2 years pass by the time the montage ends. One night, Margot goes to a friend’s house for her study-group and speaks to David who reminds her to do her chore of taking out the garbage. While David sleeps, Margot attempts to call him three times. The next morning, David is unable to reach Margot but assumes she has risen early to go to school. Later, he calls Margot’s piano instructor, but is informed that Margot had cancelled her lessons six months ago. David discovers that Margot had been depositing the money for the lessons into her bank account, before suddenly transferring $2,500 to a deleted Venmo account. Realizing that Margot is missing, David calls the police, and the case is assigned to Detective Rosemary Vick, who asks for information about Margot’s personality and friendships. Alarms start to ring and David calls her friends on Facebook and finds out that the Margot actually has no friends from school. Vick calls to report that Margot made a fake ID for herself, and shows traffic-camera footage of Margot’s car at a highway-juncture outside of the city, suggesting Margot may have deliberately run away. When David expresses disbelief at his daughter’s action, Vick tells him an anecdote about her son, who she caught soliciting money from neighbors for a police charity in her name. She reveals that she ended up covering up for her son, telling the neighbors that she created the charity, and assures David that sometimes parents have no way of understanding their children. 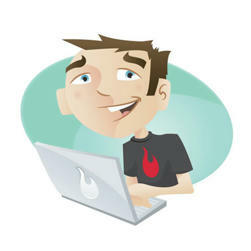 David then finds Margot’s YouCast (a live streaming website) account and sees that she has been frequently chatting with a girl who goes by fish_n_chips. He tells this to Vick who says she enquired and spoke to the girl who is innocent and has an alibi of being in Pittsburgh. David finds that Margot frequently visited Barbosa Lake, which is near the highway-juncture where she was last seen. At the lake David finds Margot’s Pokémon key chain on the ground. The police arrive and discover Margot’s car underwater and an envelope containing $2,500. A sweep of the surrounding area is conducted by the police and volunteers, but a thunderstorm slows the progress. Margot’s body, however, is not found. David tracks a classmat of Margot who claims that she was with him and fights the boy. his results in Vick telling David he can no longer take part in the investigation. Discouraged, David reviews the crime-scene photographs and notices his brother Peter’s jacket in the car. He then discovers text messages between Peter and Margot, suggesting that they had a sexual relationship. When David goes to Peter’s house to confront him, the latter explains that they actually were smoking weed together, and accuses David of being an incompetent father who did not notice that his daughter was suffering from depression. Just then Vick calls David and says that a a former convict named Randy Cartoff has confessed in an online video to sexually assaulting and killing Margot, and seemingly killing himself afterwards. An empty-casket funeral is arranged for Margot. As David is uploading photographs to a funeral streaming service, he notices that the website’s stock photograph features the same woman as fish_n_chips’ profile picture, implying that fish_n_chips is a false identity. He calls the woman supposedly behind the fish_n_chips account, and discovers that Vick had never actually contacted her. David attempts to call Vick, but instead reaches a dispatcher who inadvertently reveals that Vick volunteered to take the case, rather than being assigned to it. David googles Vick and finds that she knew Cartoff through a volunteer program for ex-convicts. He proceeds to report this to the sheriff, and at the funeral, Vick is arrested. We then get the confession from Vick that she was covering for her son, Robert. Robert was using the e fish_n_chips account to get close to Margot because he was attracted to her. Margot sent him $2500 because she thought that he was a working-class girl whose mother was in the hospital suffering from cancer. Robert felt guilty and decided to confront Margot at the lake. He surprised Margot by getting into her car, prompting her to run. While trying to explain himself, Robert accidentally pushed Margot off a 50-foot ravine. He called Vick decided to cover up the incident, pushing the car into the lake and falsifying the story of the fake ID to make it appear that Margot had run away. When David discovered that Margot had gone to the lake the night she disappeared, disproving the story that Margot ran away, Vick was forced to turn Cartoff into a scapegoat to save her son. When David asks her where where Margot’s body is, and Vick tells him that Margot’s in the ravine and that even if she had survived the fall, she couldn’t have lived without water for five days. David tells the police to turn the car around, pointing out that a storm occurred on the third day of the search which would have provided Margot with water. At the ravine, the rescue crew discovers Margot severely injured but alive. Two years later, Margot is shown to have applied for college to major in piano, with her acceptance status as pending. Photographs and textual conversations show that the relationship between David and Margot has considerably improved. Really unique perspective and a wonderfully well woven storyline along with an original execution. Good acting from Cho & Messing as well as Michelle La, giving us a great, empathetic character in Margot. 8.5 outta 10!